I helped organizing a set of five talks in my university that got companies and finalists together. One of my responsibilities was to design the website for the event. Me and a group of friends organized an hackathon with the moto to improve local communities. 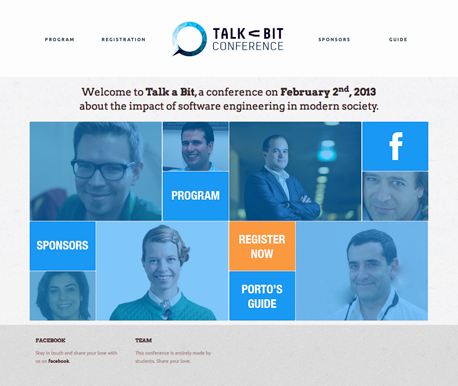 As such, I designed two websites: one for the event and one that gathers problems that can be improved. An app that eases the painfulness of shopping lists in daily life. Its major features include sharing a list with friends or family (they can edit your list), offline mode, seamless synchronization, add an item via barcode scanner or qr code, share list via sms and email. A bundle of web+mobile app with top-notch teaching materials about Software Design Patterns. A KhanAcademy for developers. Although the main content is managed by a curated team, users can submit resources to the academy, and also rate them. During my master's, I had the opportuny to create a pretend startup that developed 3 products for well-known companies. One of my responsibilities was to design our corporate website.